Pony Island contains two more of the author's tropes: trial by water, and a disapproving, older, male character. Jackie and her friend Babs are not good when near the sea. 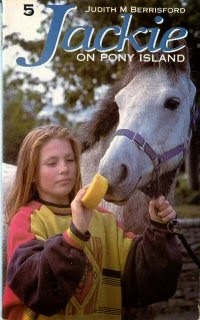 In Jackie’s Pony Camp Summer (1968), she and Misty are swept off a causeway from an island to the shore and have to be rescued; in Jackie on Pony Island (1977), Jackie and Babs are late leaving the island, and have to be rescued from deep water on the causeway. Dave finds the girls a major irritation. After he has to save Jackie and Babs from their plunge into the sea off the causeway, he is livid, and condemns them as “the silliest pony-girls I’ve had the misfortune to meet.” He's not alone in condemning Jackie and Babs: most of the books have a similar character. Poor Jackie and Babs find happiness in the end by gaining the approval of these paternalistic figures: never by striking out on their own. Success is always seen in terms of pleasing male authority figures, which gives the books a helpless, puppyish feel. When I read the Jackie books myself as a child, I certainly didn't put any feminist interpretation on what happened. I do remember feeling puzzled that the men and boys were always so very stern, and feeling that it was unfair. It was, and it is. Maybe there's room for someone to write a story where Jackie and Babs realise they don't have to please male authority. They can do things on their own.